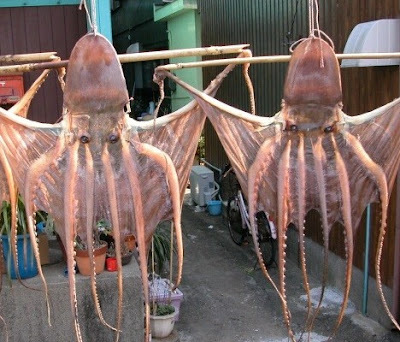 According to the very cool Pink Tentacle, when walking through the Japanese town of Toba, it's not unusual to see octopi hanging out to dry. yeah, I'm willing to bet on that too, like wet dogs and cold rotten vegetables on a compost heap, or just dead octopi. when i was little I usecd to ead baby octopus(octopi? ), but now it creeps me out. Totally cool looking. looking. I never said smelling! dude! i so want to see somthing like that in southern california! I think that's where the octipus pieces in the taikoyaki come from... Yum, I hadn't had taikoyaki in a loooong time. Look around LA, there's all sorts of unusual things going on there. I agree. It's a pretty cool picture. The oddest thing you'll see in my town is probably... someone wearing clothes on the slightly unusual side.